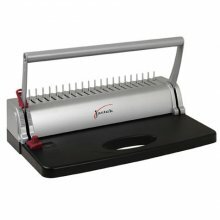 The Jastek 80C comb binding machine is an entry level manual comb binder, suitable for occasional use. Keep your documents organised to a tee with this 21 ring manual binder. Easy to use with step by step instructions for a perfect results every time.